Separated by War. Tested by Battle. Bound by Friendship. Time to take a look at the first wonderful poster for this year's potential Best Picture winner. 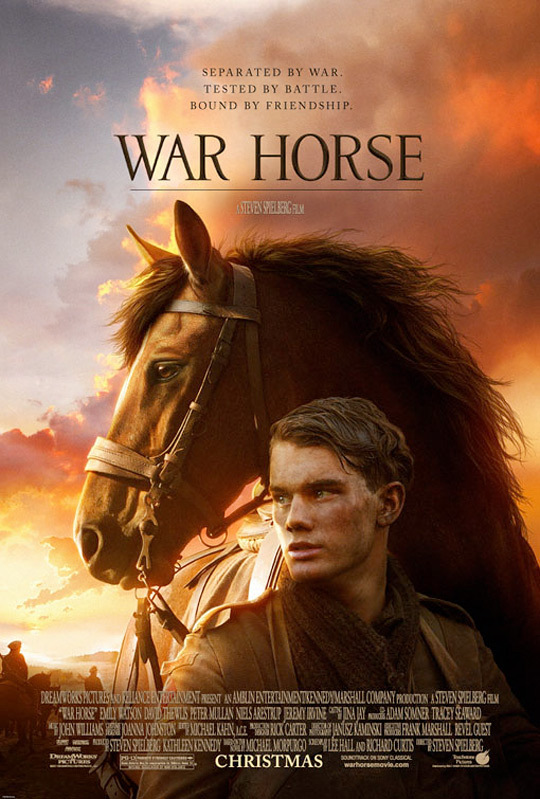 Our friends at Entertainment Weekly have debuted the first full theatrical poster for Steven Spielberg's War Horse, starring Jeremy Irvine and his horse Joey. This design is reminiscent of the book's cover that this is based on, but with Irvine and a much more colorful and epic Spielberg feel to it. While we're already well into the awards season, this is one of my most anticipated left this year, can't wait to see it! This looks like the start of their marketing leading to its Christmas release. this movie looks incredible. can't wait. We need more WWI movies. That was some of the nastiest, most brutal warfare in history. I'm glad Spielberg is tackling this, I know he can pull it off. I'm honestly not too thrilled about the relationship between a boy and his horse, but I'm sure it will good. look at that horse. that horse is amazing. Saw the play in NYC last June. I was skeptical before the play started. A horse story in WWI? At the conclusion of the play I was stunned and totaled awed with the story. No spoiler here, but the story of the use of horses in WWI is fascinating, and combined with the story of Albert and his love of the horse is really inspiring. Part of the greatness of the play version is the use of horse puppets (2 men under as the legs, 1 moving the head) that mimicked horse movements remarkably lifelike. How the story line transfers over to a movie version will be interesting to see. I'm with Alex: if it is done well, this could be an Oscar contender. It looks like Sarah Jessica Parker may get an Oscar nom next year. if you're suggesting what i think - that's cold......but funny! Sure it's a great story but Spielberg has burned me one too many times. So I'm going to have to pass. Nothing special about the poster. Generic, uninspiring and obvious. Sorry.